Faerie Card Reading for the Week of August 13 – 19, 2018. 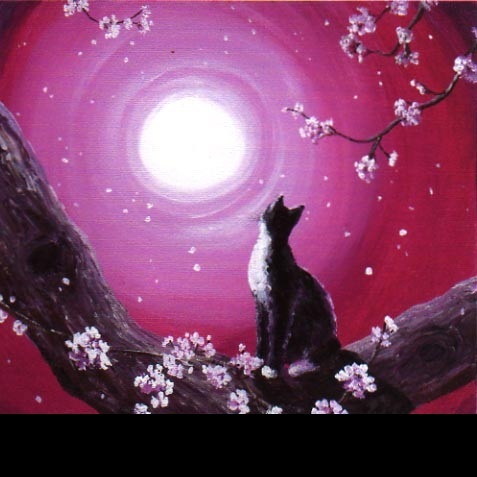 Card: Seven of Sky – from the Mystical Cats Tarot by Lunaea Weatherstone. Message from the Faeries: We hope that you’ve had fun the last few weeks, going on adventures, meeting new people and trying out new things. It’s good to let yourself let loose and do something different from time to time. This week it is time to change gears. It’s time to sit down and get to work. It’s time to set a new tone to your daily routine. It’s very easy to get distracted by even the most boring and mundane aspects of day to day living. That’s why we asked you to do some fun new things the last couple of weeks. We want you do something else new this week. We want you to start a new routine. Take a moment at the beginning of the week to reflect on what matters the most to you right now. What are you being distracted from? How are you allowing yourself to be distracted? After you figure out what you really need to be focusing on, try to come up with a plan to get it done. If you have to, come up with a schedule, or think up a new pattern of behaviour and actions, to ensure that you are able to be successful at your goals. It’s time to come up with new ideas and new ways of thinking. The old patterns and behaviours are no longer serving you. We know that new things can be frightening or intimidating, but if you’ve done something new, as we instructed, then you will have learned that new can be fun and exciting. New is almost always well worth the try. Over the last year or so it has been brought to my attention that I am emotionally influenced by the Moon. I’m not saying that I blame the moon for my emotions. I just see a very distinct pattern and a strong correlation between my emotional body and the lunar calendar. I am wondering how many have you have also noticed a correlation between how you feel and what phase the Moon is in. My pattern seems pretty set. A few days leading up to the full moon I often feel a bit tired and emotional. Sometimes I feel quite melancholy and sad during this time, I also become more introverted and reflective. I would rather be alone and inside during this time, and I also am more prone to emotional eating. Then on the day of the full moon I tend to feel a bit energized and I feel more alert than usual. I also feel like everyone around me is acting a little out of character – but maybe it’s me, haha! Usually a day or two later my menstrual cycle starts and I feel a bit sick and tired for a day or two and then I feel fine. Gradually as the moon wanes, I become more energized and I start to feel really great and I have more energy. By the new moon I feel really good – grounded and centered and quite on top of my game. Then as the moon waxes I gradually become less energetic, and thus begins the cycle again. It seems like it is quite natural to be influenced by the moon. I mean, the ocean’s tides are affected by the waxing and waning of the moon. Our body is made up of mostly water. Perhaps that isn’t very scientific reasoning, but it makes sense to me. I am wondering though, if I could perhaps find better ways of coping with this pattern. For example, when I am feeling more tired and emotional, maybe if I stopped eating junk food during this time, I would probably feel a lot better. How does the Moon influence you? 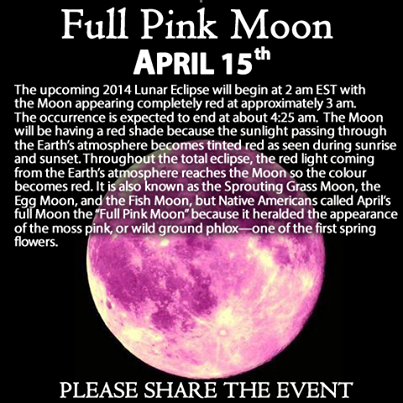 It’s the Pink Moon in a couple of days. I hope we all have clear skies to enjoy the beauty of the Moon. 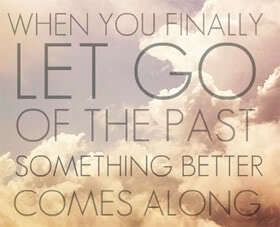 Recently I have been learning some very important and difficult lessons in letting go. The faeries, as well as my other guides, have been giving me very strong messages about letting go of things that are no longer serving me. This includes old patterns, habits, and ideas. There are a lot of things that I feel need to let go of. The most challenging part of letting go is letting go of people. A friend of mine once told me “You don’t get to choose your friends, your friends choose you.” I used to hold on to this idea quite literally in a way where I felt that I had to stay in friendships no matter what because these people chose to be my friend and I needed to honour this in every possible way. Well, I realize now that although I am very fortunate that people choose me as a friend, it is not really serving anyone’s highest good if I stay in relationships and friendships that are unhealthy and aren’t in accordance with my highest good. I’m going to be honest and say that I find it very difficult letting go of people, even when that person is not very nice to me and isn’t respecting me. I feel some sadness, guilt and frustration. I feel sad because even though a relationship really wasn’t working out, I still am able to remember all the fun times. I feel guilty because I feel on some level I am abandoning someone in this crazy world. I feel frustration because somewhere deep inside I feel terribly misunderstood by virtue of the fact that I think that the people I have to say good bye to don’t really understand that despite everything I really love them and value them. Despite some of these unpleasant feelings, I also feel really good about my decisions. I feel good because I am really truly listening to my heart – my soul, and I am also really listening to the faeries, the angels and my other guardian spirits. Before, I used to ignore my intuition and my heart, and this would inevitably get me in to lots of trouble. Now, I am really learning to listen to myself and actually follow through with what is truly best for me. I am now understanding that it takes a lot of courage and self-respect to do this. I can tell you, without a doubt, that it is so important to trust yourself and to listen to those little messages that are niggling at you. Even though it is really difficult to let go of these patterns, habits and people that are not serving our highest good, there really is no time like the present to start taking better care of ourselves. The faeries keep telling me that this is a very monumental time in our human history, and that all our actions now will have a major affect on our futures. So when we let go of all these things that aren’t good for us we allow for new opportunities – new patterns, new ideas and new friendships to come into our lives. These aren’t really goodbyes, they are hellos.